At left, Katie Flood of Dowling Catholic surges ahead of the 4A girls pack early. 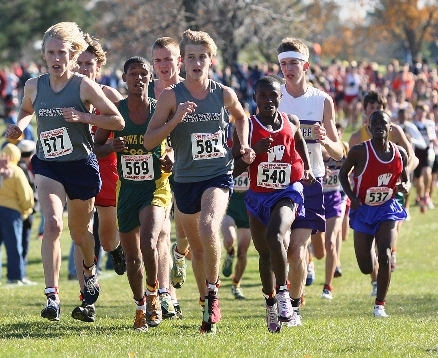 At right, the boys 4A race was much closer. Eventual winner Devin Allbaugh (577) of Pleasant Valley leads with teammate Charlie Paul (582). Obsa Taddese of Iowa City West (569) would finish second by a second. Photos by Jim Kirby. Led by the record-setting performance of soph Katie Flood, HL#2 Dowling Catholic crushed the field in Girls 4A, finishing with 32 points to 2nd-place Urbandale's 110. Urbandale was followed by Iowa City High 119, Johnston 120, and Iowa City West 146. Katie Flood scorched the course in 13:27, beating the 14:04 record she ran last year and continuing to establish herself as a national championship contender. DC put 4 at 14:45 or better, and in the top 8, including Ashlie Decker (2nd 14:00), Tanelle Berard (6th in team race, 14:33), and Betsy Flood (8th team, 14:43). The performances of Decker and 3rd-place finisher Shelby Houlihan of Sioux City East (14:02) also make them contenders to place high in national competition. More blazing times were turned in during the 1A race by North Tama Traer sr's Blaire and Brooke Dinsdale, who ran 14:01 and 14:05. Brooke had won two state titles previously; this was Blaire's first. Traer had the race won through 4 runners, but better depth through 5 won the race for St. Albert of Council Bluffs with 84 points, while Traer was 4th. Decorah nipped Denver/Tripoli in 3A, 114-116. A 20-point advantage at the 5th runner was the key. Grinnell's Danielle Nowasell won overall in 14:24. In 2A, LaPorte City Union edged Tipton, 92-97, again with a big edge with the 5th runner. Hudson in 3rd also had good depth, but not quite as strong up front. The individual title went to Central Lyon/George-Little Rock's Steph Wibben in 14:40. In 4A, Devin Allbaugh took the individual crown in a tight battle with Iowa City West's Obsa Taddese, 15:39-15:40. He led HL#5 Pleasant Valley to victory, as they held an 83-126 margin on 2nd-place Des Moines Roosevelt. Charlie Paul (5th 15:52) and Austin O'Brien (9th 16:02) were also in the top ten for the winners. Waukee's Tyler Rich was also under 15:50 in 3rd (15:47). Honorable mention HL teams Marshalltown and Cedar Falls were 5th (153) and 8th (176). Cedar Rapids Xavier easily won 3A, scoring 69, ahead of Pella's 115. Charles City's Isaac Wendland topped Xavier's Aaron May for the win, 15:47-15:50. With the 3rd-best time of the day, 15:43, Nate Dotterweich led Monticello to the 2A victory. They tallied 100 to Wilton's 117. Iowa City Regina scored 55 to beat Calmar South Winneshiek (83) for the 1A crown. Gowrie Prairie Valley's Aaron Vosberg was fastest by 11 seconds in 15:56. On October 17th, in the confines of the State Historical Building, Iowa governor Chet Culver recognized gymnastics world champion (and likely 2008 Olympian) Shawn Johnson as the state’s latest sports darling. And rightfully so, the 15 year old Valley High School sophomore is the best in the world in her field. But is anyone aware that across town – at Dowling Catholic – there is another sophomore prodigy showcasing her talents not on the balance beam but on the running turf? Let me rephrase that. Is anyone, who did not witness the display of dominance at Kennedy Park on Saturday, aware that Iowa boasts a national title contender in the great and “not always so publicly renowned” sport of cross country? They should be. She also told The Des Moines Register, “I ran hard, I ran as fast as I could go." But Girls 4A action was not solely about Flood’s individual dominance. It was also how Dowling Catholic, as a team, blasted through the power lock that the eastern Iowa schools, namely Iowa City High and Iowa City West, have held on the State Meet over the last two decades. This was done convincingly, as Dowling Catholic scored 32 points (14:20 top five average) in claiming their first girls team championship, placing three runners in the top 10 overall (Ashlie Decker 2nd; Tanelle Berard 7th), and all five in the top 20 (Betsy Flood 12th, Heather Tobias 19th). The Urbandale girls, also from central Iowa, were second with 110 points. No doubt, Dowling Catholic felt the emptiness of finishing second last year to Iowa City High. “They didn’t want to go through the disappointment they went through last year” said Kirby. Their eager and refreshing spirit will continue on to the Nike Team Regionals in Sioux Falls, and Katie Flood and Ashlie Decker will also head to Kenosha (Foot Locker Midwest) to seek individual achievements. At the end it was Albaugh and Obsa Taddese of Iowa City West battling for the win, with Allbaugh prevailing by one second, 15:39 to 15:40. Seniors Blaire and Brooke Dinsdale of North Tama, in Girls 1A, raced again to a 1-2 finish (duplicating their sophomore year result; they went 1-3 last year). However, this year it was Blaire (2nd on the 800m prep list in 2006- 2:07.39) the victor and two time state cross country champion, Brooke, taking second to her twin sister. Their times (14:01 to 14:05) are extremely good efforts by the half milers, by far the best they’ve run at State, and should forecast a solid senior year track campaign.